Willie Rodger (b.1930) was born in Kirkintilloch and trained at Glasgow School of Art from 1948 to 1953. 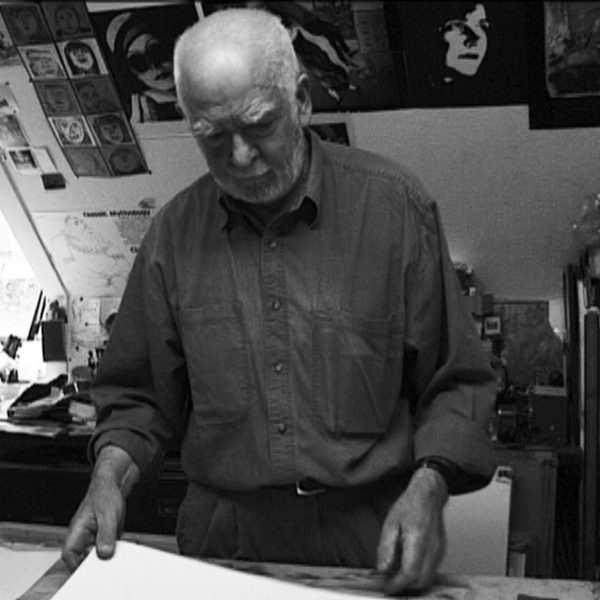 He was Principal Teacher of Art at Clydebank High School from 1968 to 1987 and has exhibited his printmaking and paintings widely in Scotland since 1954. In association with John K Clark, Rodger has designed stained glass windows since 1985 for the Parish Churches of Kippen, St Mary’s Kirkintilloch and Milton of Campsie. Other commissions have included the award-winning Scottish Historical Playing Cards and illustrations for The Colour of Black & White; Poems 1984-2003 by Liz Lochhead (2003) and The Field of Thistles by Monica Clough (1983). Rodger made a series of linocut prints available to Dovecot in 2004 to be interpreted in the medium of both gun-tufted rug and tapestry.